Phill Mejia of Cleaning and Restoration Supply of New England inherited a non-functioning website when he was hired. His company sells carpet and upholstery cleaning supplies. 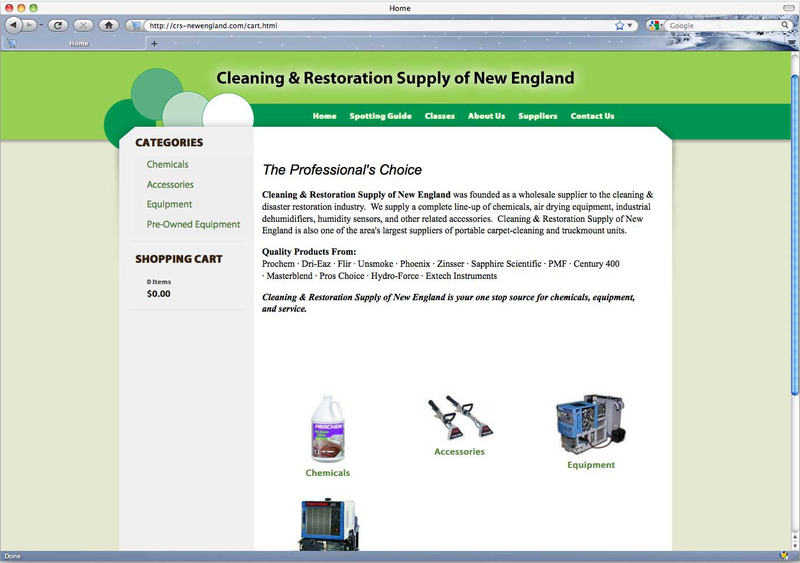 When the name changed to Cleaning and Restoration Supply of New England, it was the perfect time to create a new website, with complete shopping capability. Phill and I worked together to create a fresh new look for the company, as well as an easy-to-use online shopping experience. Phill also can edit his new website with ease, changing prices, adding or deleting products, and listing carpet and upholstery cleaning class schedules. check out the 2500 items for sale, and see how they can do specials, discounts, featured items, etc.